Kiki Dee began singing with a local band in Bradford in the early 1960s. Her recording career began as a session singer. She sang backing vocals for Dusty Springfield, among others, and was well regarded by other singers but did not achieve solo success in the UK for many years. In 1963 Dee released her first single "Early Night", and recorded her debut album I’m Kiki Dee, which included a series of Phil Spector style tracks and covers for Fontana Records. Her 1966 release "Why Don't I Run Away From You" (a cover of Tami Lynn's "I'm Gonna Run Away From You") was a big hit on Radio London and Radio Caroline, and she sang the B side "Small Town" in her appearance in Dateline Diamonds the same year. Her 1968 release "On a Magic Carpet Ride", which was originally a B-side, has remained popular with the Northern Soul circuit. Much of her early recorded work for Fontana Records was released on 24 January 2011, on the CD compilation I'm Kiki Dee. Songwriter Mitch Murray created her stage name and penned her first single, "Early Night". In the United States she became the first white British artist to be signed by Motown, releasing her first Motown single in 1970. In the days before BBC Radio 1, Dee was a regular performer of cover versions on BBC Radio, and she starred with a group of session singers in the BBC Two singalong series, One More Time. She also appeared in an early episode of The Benny Hill Show in January 1971, performing the Blood, Sweat and Tears hit, "You've Made Me So Very Happy". Nevertheless, it was only after she signed with Elton John's label named The Rocket Record Company that she became a household name in the UK. 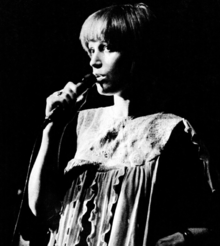 Her first major solo hits were "Amoureuse" (written by Véronique Sanson, with English lyrics by Gary Osborne) (1973) and "I've Got the Music in Me" (written by Tobias Stephen Boshell), the latter credited to the Kiki Dee Band (1974). In addition to her burgeoning career as a lead vocalist, she could sometimes be heard singing backing vocals on various Elton John recordings, such as "All the Girls Love Alice" on "Goodbye Yellow Brick Road" and various tracks on Rock of the Westies. Her biggest hit came in 1976 when she replaced an ailing Dusty Springfield for the recording of a duet with John, "Don't Go Breaking My Heart" (pseudonymously written by John and lyricist Bernie Taupin). The single reached No. 1 in both the UK and US, remaining at the top for six weeks in the UK. After a quiet period in the late 1970s, Dee launched a comeback in 1981, releasing one of her biggest hits, "Star", written by Doreen Chanter of the Chanter Sisters. This later became the theme music to the BBC1 programme Opportunity Knocks between 1987 and 1990. Also in 1981, Dee joined forces again with Elton John, recording a cover of the Four Tops' song "Loving You Is Sweeter Than Ever" which was written by Ivy Jo Hunter and Stevie Wonder. Both of these were included on her album Perfect Timing, which became a modest hit on the album chart. In 1983, she supplied backing vocals to Elton John's album Too Low for Zero. Dee also sang the song "What Can't Speak Can't Lie" (1983), composed and recorded by the Japanese jazz fusion group Casiopea, and with lyrics by Gary Osborne. In 1985 she performed at Live Aid, reprising "Don't Go Breaking My Heart" with John, and performing backing vocals on the other songs in his set. In 1992, she also contributed backing vocals on John's The One album, and a year later recorded "True Love" with John for his 1993 Duets album. Dee released the live album Almost Naked a joint effort between Kiki Dee and Carmelo Luggeri in 1995 followed by the studio albums Where Rivers Meet (1998) and The Walk Of Faith (2005) with musical partner Carmelo Luggeri. In September 2013 Dee and Luggeri released their third studio album A Place Where I Can Go on Spellbound recordings. Dee's single "Sidesteppin' with a Soul Man," released in October 2013, was her 40th single release. Dee has also appeared in musical theatre, notably in the lead role in Willy Russell's West End musical Blood Brothers, in which she took on the role originally played by Barbara Dickson for the 1988 production and recording. She received an Olivier Award nomination in 1989 in the Best Actress in a Musical category. In 1990, she contributed to the last recording studio collaboration between Alan Parsons and Eric Woolfson, on the album Freudiana, performing "You're On Your Own" and part of "No One Can Love You Better Than Me". In 2008, Dee's first DVD was released. Under The Night Sky was a collaboration with guitarist Carmelo Luggeri, filmed live at the Bray Studios in London; the music was produced by Ted Carfrae. That same year, several albums from her earlier 1970s–1980s Rocket catalogue were re-released by EMI Records, including an expanded edition of Almost Naked with extra tracks, including a cover of Neil Young's "Heart of Gold" and a new take on "Sugar on the Floor". Also that year, Demon Records (UK) issued a remastered edition of Perfect Timing, with several bonus tracks including an alternate mix of "Loving You Is Sweeter Than Ever." Dee had previously starred in Pump Boys and Dinettes in London's West End, at the Piccadilly Theatre, from 20 September 1984 to 8 June 1985. Kiki Dee has never married. She lived in California with Davey Johnstone, a guitarist in Elton John's band, at the age of 28. In her late thirties, she was diagnosed with an early stage of uterine cancer. Kiki Dee has released 40 singles, three EPs and 12 albums. Kiki Dee (right) performing at London's Royal Albert Hall, October 2009, in aid of the PRS for Music (formerly the Performing Right Society) for Music Members' Benevolent Fund. 1976 "Don't Go Breaking My Heart"
^ Paphides, Pete (28 January 2011). "There's more to Kiki Dee than Don't Go Breaking My Heart". The Guardian (UK). Retrieved 24 October 2014. ^ a b Nicholas, Sadie (17 September 2013). "Kiki Dee: I've had music in me for 50 years". Express. Retrieved 24 October 2014. ^ a b c Roberts, David (2003). British Hit Singles & Albums (16th ed.). London: Guinness World Records Limited. p. 149. ISBN 978-0-85112-190-1. ^ a b c d e Ruhlmann, William (6 March 1947). "Kiki Dee – Music Biography, Credits and Discography". AllMusic. Retrieved 17 February 2013. ^ "Kiki Dee". Internet Movie Database. Retrieved 2 August 2016. ^ "Kiki Dee Discography". The Kiki Dee Information Bureau. Archived from the original on 1 July 2002. ^ "Lyrics to 'What Can't Speak Can't Lie'". kikidee.info. Archived from the original on 8 September 2005. ^ "Casiopea – Jive Jive (Vinyl, LP, Album)". Discogs. 8 October 1983. Retrieved 16 February 2013. ^ Barber, Richard (21 August 2008). "'I've still got the music in me' says Elton's old pal Kiki Dee". Daily Mail. Retrieved 16 February 2013. ^ a b Roberts, David (2006). British Hit Singles & Albums (19th ed.). London: Guinness World Records Limited. pp. 146–47. ISBN 978-1-904994-10-7. Wikimedia Commons has media related to Kiki Dee.